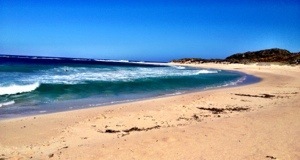 The next couple days in Perth were a blur of awesome. More BBQ’s, movie evenings with the roomies, long days spent in the surf, and a day long concert on the beach with Kiwi band Fat Freddy’s Drop. 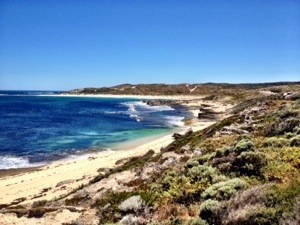 Perth was quickly becoming a new favourite! 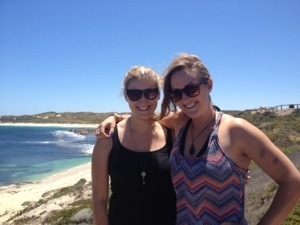 Then came Monday, and Kelsi, Dan, Glen and I decided to road trip to Margaret River for some camping. We hopped in the car with breakfast and a latte and started the drive by 8am. 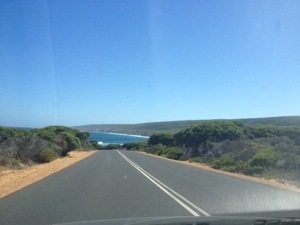 The coastline in Western Australia is reminiscent of our road trip through South Africa… Aka: spectacular. The surf is incredible, the whole place is lined with well kept vineyards, and Kangaroos can be spotted under trees along the way! (Although the only one I saw was dead on the side of the road…) we stopped at a few viewing points on our way down, and a quick dip and some Sunshine in Gas Bay. The waves in the area are much more suited to surfing than swimming, but it was nonetheless entertaining to see Dan and Glen getting nailed by the surf and rolling to shore. From Gas Bay we went into the little town of Margaret River for some lunch and camping essentials (three bags of buns, a roll of toilet paper, ice, 60 beers and some atrocious white trash outfits from the thrift shop… We were really going all out). We were just minutes away from camp and could already taste the icy Emu beers we were going to have, when we blew a tire. Great. We pulled over on the side of the road, and sure enough, the back left tire was completely flat. So we piled out and had to remove ALL our camping gear from the trunk to reach the spare tire. Took us about 20 minutes to change the tire, and make sure the cooler was full to the brim with ice and bevvies! Then we carried on our way. The campsite cost $10 per person and was to be paid in cash at the reception. Pick your campsite. Then go pay. That was the routine. So we drove around the corner, picked a nice spot, well away from everyone else, and Kelsi and I collected the cash. The problem was, when we arrived, signs pointed to the campsite being an alcohol free zone. With 60 beers in the cooler, this clearly wasn’t our plan. Okay! So Kelsi and I piled in the car are started driving back to reception. “Is this the way we came in?” Asked Kelsi. We drove round the corner and ended up on the other side of our chosen campsite. “Oh look! There’s the boys! Dammit, we went in a circle. I’m gunna honk at them” I reached over and gave a beep on the horn. Dan and Glen looked up, confused at why we were on the other side now, and waved. “Guess that wasn’t right” said Kels “I’m gunna take a left up here and see if we can swing back that direction. We passed some family campers, and a couple other RV’s along the way. Then I looked up and giggled. “Look! There’s the boys again! I’m gunna honk!” I reached over and beeped the horn again. “Oh my god!” Exclaimed Kelsi. “Did we go around AGAIN? !” We drove out and turned a couple corners. We went through three different sections of the park before coming around a familiar bend. “This looks right! I remember this!” I said. “Oh no wait… Oh no… There’s the BOYS again!” I started laughing and beeped the horn a third time. They looked up incredulously at us. Seriously? What are you girls doing?! We passed the boys four more times. I was in fits of laughter. I couldn’t handle it, and I couldn’t refrain from honking the horn each time, much to the chagrin of Kelsi, who tried to stealth by a couple times. 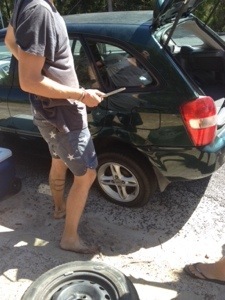 We finally found another car and asked them the way out… We were two turns from our campsite to reception. I just about died laughing. “You mean we only had to take two rights and we were there?! ?”said Kels, also dying of laughter. I fell to the ground in giggles. We’d been driving for at least 20 minutes, back and forth in front of the boys what felt like 100 times, and we didn’t actually have to go anywhere! We piled back in the car. Okay. Two turns and we should be there! But the paths were all one way streets, and it wasn’t as easy as it looked. All of a sudden we pulled round a bend. They just threw their arms in the air at us. They were already a couple beers deep and fully dressed in their white trash outfits. How did we mess this up so much! Sure enough, 2 minutes later I reached over and beeped the horn. “Hey guys! !” I yelled out the window. A couple more minutes and we were back on the proper side of our campground where we could park. I stumbled out of the car laughing… We hadn’t even had a drink and we were already this ridiculous. 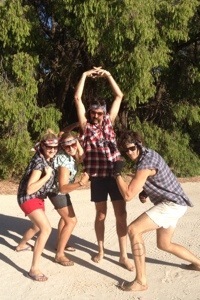 We dressed up in jean cut offs and plaid vests. We looked good! We forgot playing cards, so instead used two dice to play drinking games. We played a version of Kings Cup with two dice, designating the dice numbers 2 through 12 as a challenge instead of ace through king. Seemed like a genius idea… Until we realized the game never ends. With cards, it’s 52 cards and the game is over. With dice: you just keep playing… Forever. So we played a combination of kings and wizard sticks (where you tape each beer can to the bottom of the next until your wizard stick (or beer spear in Canada) is taller than your head. We played until Dan, at over 6 feet, won the game and the night became so dark we couldn’t see anymore. We then found a field to watch the billions of starts in the sky. We were so far away from civilization, that the constellations were spectacular! And then, after way too big of a day, we called it a night. 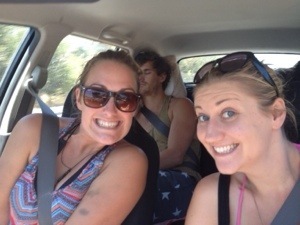 Margaret River White Trash Camping: Check! Goofs! And you hadn’t had much to drink!